As beautiful as Fall is and as much as my family and I enjoy it, a part of me is holding on to Summer and the official week or so we have left. We are still enjoying the bounty our Summer favorites like of tomatoes, corn and cucumbers! Growing up in the outskirts of Philly, my dad grew a HUGE garden. The largest in our neighborhood. I wish now that I had paid more attention. Lucky for me that living in Bucks County, Pennsylvania means that I have a ton of farms, farmers markets to choose ingredients from. Nothing says makes me think of childhood summers or a quintessential American food more than corn. I know many concerns exist about just what is in our corn these days so as a family, we don’t eat it too often. When we do I make sure we enjoy it at its peak. This special soup celebrates all of the above for me and being able to get local PA or NJ corn makes it even better. My whole family enjoys this corn soup. 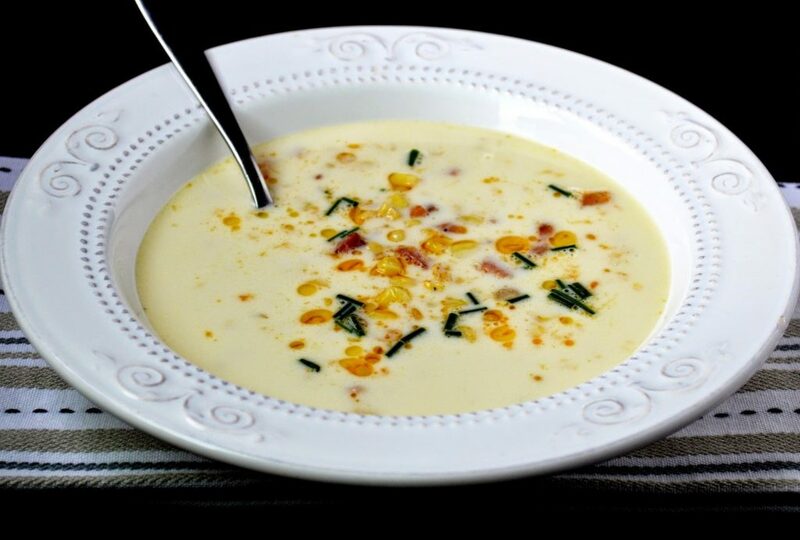 Usually I go for thick soups, this one is more elegant and you taste the deliciousness of corn bite after bite…and bacon…bacon always makes me happy! Heritage Farm which is an urban organic farm located in Philadelphia adjacent to The Methodist Home for Children (very close to The Belmont Mansion). It is a small organic farm that grows produce for the Children’s Home. It doesn’t stop there, it is dedicated to educating the families and children of Methodist Home and the community about healthy eating and a healthy life style. They also provide resources for the children and families to learn about farming and agriculture, career training, etc. by educating them on the process seed to sale. It is an amazing mission and one that I am happy to support! So far the list of participating chefs and restaurants are: DiBruno Bros, Derek’s, Bar Ferdinand, High Point Bakery, Philly Cow Share, Winnie’s Le Bus, Russet, Weckerly’s, Chester County Cheese Artisan’s and more! To learn more about Heritage Farm, check out their website. To buy tickets to both support and enjoy this worthy and delicious unique event click HERE. Remember to deduct the cost come tax time, since it is in support of a charity! I was going for a more elegant soup and purposely wanted a thin broth for something different. I wanted to taste corn and by using corn at its peak this soup delivered! If you are looking for a thicker soup, you may want to cut the kernels off of the corn in the first stock, then puree them into the soup however I am not quite sure how that would be. If you love soup as much as I do, here are 2 of my favorites that I am very proud of to try: Easy Chicken Pho, Roasted Zucchini & Cheddar Soup and Garlicky Tortellini & Tomato Soup. Simmer corn for 30 minutes over medium heat. Strain broth and set aside. Cut kernels from the cobs and reserve, covered. Cut cobs in half and simmer over med-low heat in the milk for 20 minutes. Set aside and allow the cobs to soak for 30 minutes more. In a saute pan, saute bacon/pancetta till just-crisp. Remove from pan and set on paper towel. Add shallots and corn to the skillet and bacon grease and saute for about 5 minutes or until the corn is done. Season with salt and pepper. Set aside. Meanwhile, combine both broths and bring to a boil, reduce by 25%. Taste and adjust seasoning (add a small amount of red pepper for a bit of heat if so desired). When ready to serve, ladle broth into bowls, place corn, bacon and chives in the center, drizzle with a small bit of chili oil and serve (hot). that looks so good. Is corn in season now in the area? I was gonna add chicken corn chowder to our meal plan this week but it got bumped for next week. I already grow tomatoes, peppers and blackberries but I've been wanting to try potatoes and broccoli. I totally want to try potatoes too!! I was just talking to the kids and hubs about that! This looks amazing! Going out to grab extra corn JUST so I can make this all winter long! Thanks for supporting such an amazing cause! OMG – seriously, this looks AMAZING. You had me at corn & bacon! YUM! Reading through your soup recipe makes me wish I HAD bought corn yesterday at Linvilla Orchards! I've always wanted to grow my own vegetables. Zucchini and tomatoes would be a must during the season. In my raised-bed tiered garden, I would grow herbs. My regular garden is far out in my back yard (huge lot, here), but I could place this closer to my house — and kitchen! You had me at BACON! This sounds incredible!! I cannot wait to give it a try! I would grow herbs such as basil, oregano, chives, and thyme. I'd grow "salads" – several varieties of lettuce, tomatoes and peppers. Oh wow. This soup looks absolutely amazing. Perfect for relishing the last bit of summer. This soup looks perfect! I don't care if the flavor is "Summery" To me, Fall/Winter is soup season and my spoons get their full use this time of year! This soup is awesome! Gosh that first image is pure gorgeousness. I really didn't get a belly full of summer corn this year and now seeing this I crave some. I'm not sure what I would grow – maybe tomatoes!! I use a lot of those. Thanks for the great giveaway!! 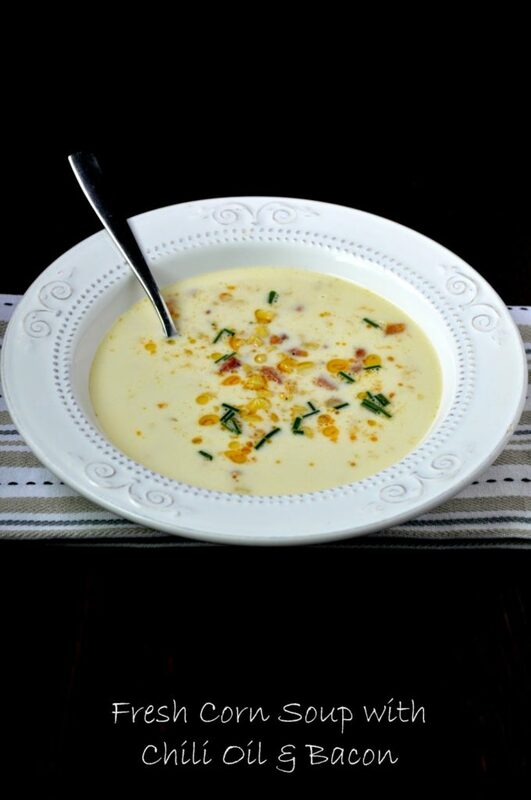 Corn chowders and soups are my all-time favorite – and with bacon and chili oil added…yum! Love creamed corn EVERYTHING> Would grow lots of herbs in my raised bed garden. Yum! I would grow herbs, strawberries and peppers. This is such a cool idea! I wouldn't even have to ask my HOA if I could plant it. I'd like to grow tomatoes and peppers. Corn definitely says AMERICA. This is a wonderful use of this staple. I agree it's elegant. I like your post about the Heritage Farm and the Children's Home. Thank you for sharing. I really want to grow chilies and herbs!! This soup looks incredible! I'd eat this all year long! The soup looks great! 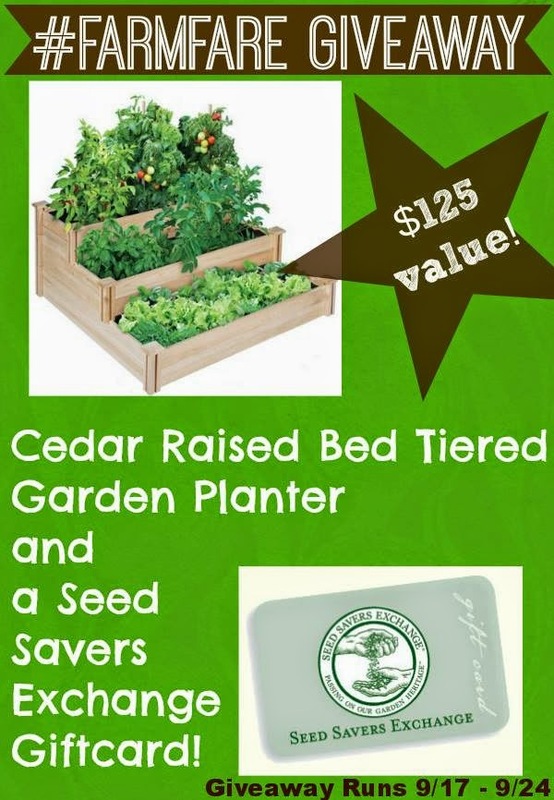 If I win the raised bed garden, I would move all my herbs and strawberries I have in pots into it. Oh, I love corn. And even better when place in soup! This recipe sounds like a winner! This sounds amazing! I make a corn sausage chowder that I love but it isn't this pretty! What a beautiful and a great use of peak season corn. The bacon and chili oil sound like excellent complimentary flavors as well. Must make before corn season is over! The chili oil is genius! Must.Make.Now!! This corn soup looks sooooo delicious! The chili oil – Over the top – I love it!! Every year I plan to make corn soup or chowder and corn season passes me by. I have to run out and get corn now! I would love to grow a big herb garden…and some tomatoes! This soup looks out of this world! I love it! I would grow more strawberries I have a lower bed and the squirrels eat them all!